So fat balls are all the rage lately and I feel the same way about them that I do juices-- they are awesome accessories for nutrition, not the main course. They are definitely an awesome way to pack in the nutrients with multiple sources of superfoods in a delicious bite-sized snack. So I made these for my mom for that exact reason! My mom tends to be a very picky eater and I am always concerned that she doesn't get her weekly requirements of healthy fats, protein, and superfood items. So, while I can't have these fat balls (I am sensitive to have this density of nuts in a single serving, particularly raw ones), this is THE perfect vehicle to deliver everything my mom is missing day to day. I threw in collagen to get her that protein + amino acids and same with the chia seeds for extra omega-3's to boot. She has a wicked sweet tooth, so I used dates, which are packed so full of wonderful minerals like iron, potassium, magnesium, and zinc. I also have been having my mom start using CBD (as I have for a few months now, more on that later), so it's easy to slip CBD oil right into these. I wasn't sure which flavors she would like, so I came up with two varieties. Thankfully, she loved both! 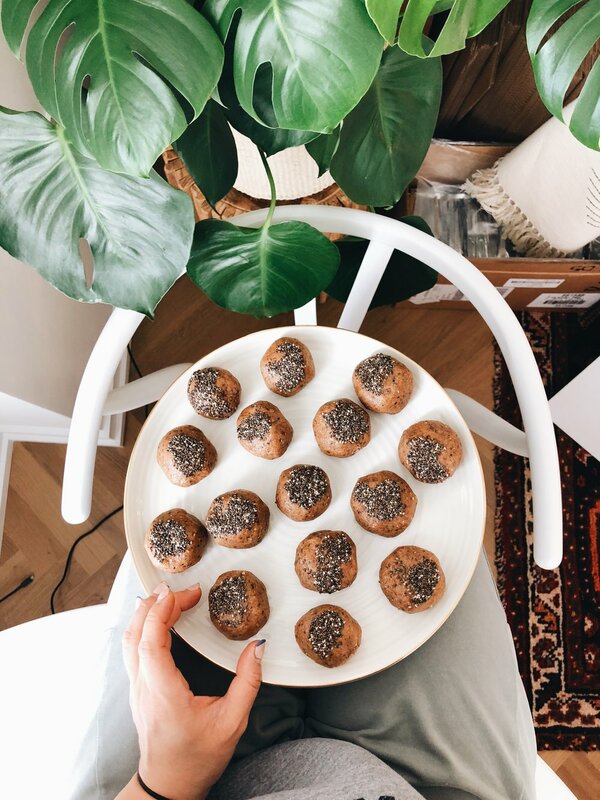 The Cinnamon Pecan Chia with Maca smelled like a cinnamon bun and tasted like snickerdoodle cookie dough, then the Sesame Tahini Walnut tasted like halva + cookie dough simultaneously! The method to make them is the same, but I've included both variations below. Feel free to experiment, just keep the ratio of wet ingredients to dry ingredients around the same. 1. Place nuts (pecans or walnuts) in a large food processor and pulse until a small crumbly texture (careful to not over process or it will start to turn into nut butter!). Transfer nuts to a bowl and set aside. 2. Place dates, coconut oil, vanilla extract, and tahini OR nut butter in food processor, and process until a uniform and creamy texture. Add collagen (and optional CBD oil), cinnamon, and any remaining spices you wish to add, and process until smooth. 3. Add nuts back into the processor and pulse until well combined. 4. Empty mixture out into a large mixing bowl. Add chia seeds and use a spatula or your hands to blend. Using your hands, form dough into 1.5-2 inch balls. 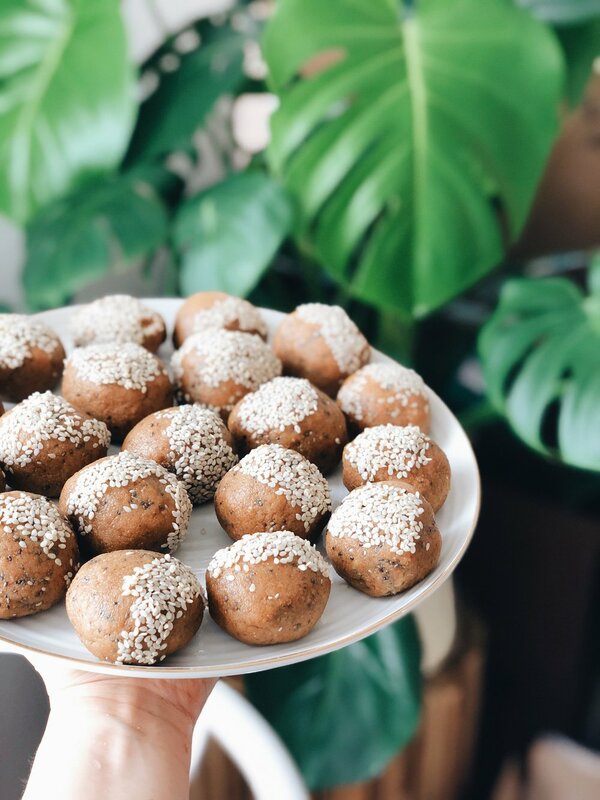 You can also roll the balls in sesame seeds or tahini for decor and extra nutrients! 5. Keep in an airtight container in the fridge for up to 10 days or in the freezer for up to 3 months.